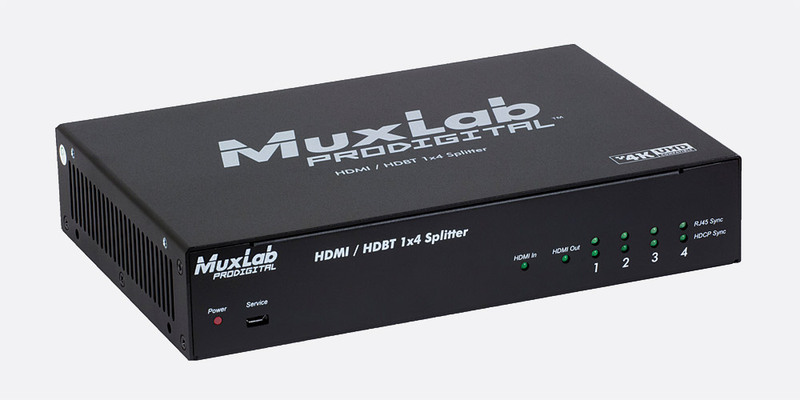 Muxlab HDMI splitters accept a single HDMI input and distribute it to multiple HDMI outputs. These 'plug and play' splitters are intended for commercial and residential AV systems. 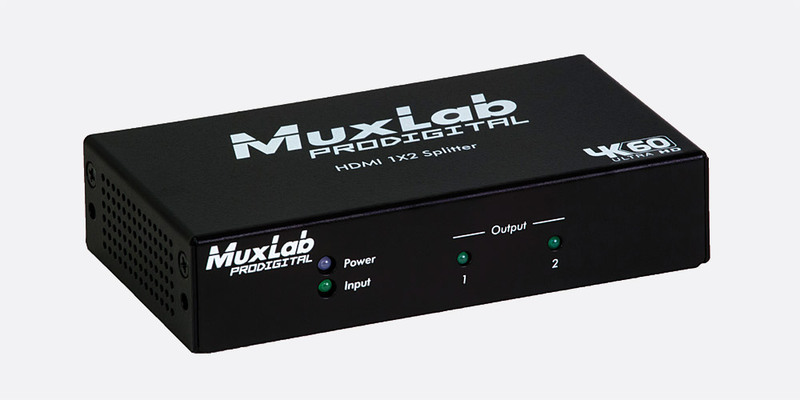 They may be suitable for digital signage (DOOH), retail displays, media centres and other applications where it is desirable to distribute a single HDMI signal to multiple display devices. Optional accessories: Cables, see HDMI Cables. 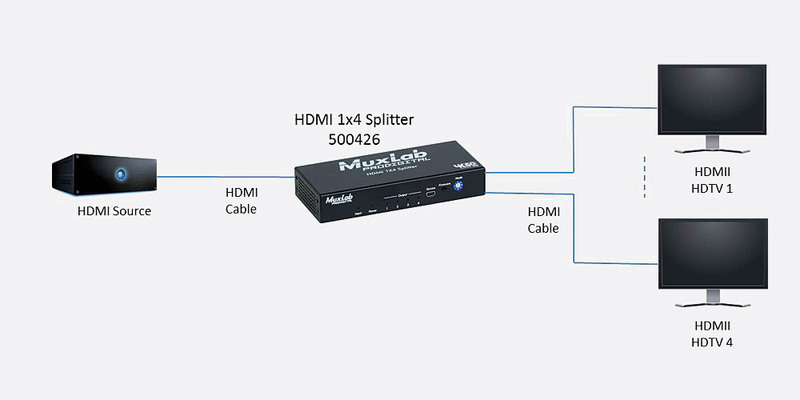 These metal enclosed HDMI 1.4 splitters are HDCP 1.3 compliant and support 3D and up to 4K (3840 x 2160), 1080p at 60Hz, 12-bit deep colour and LPCM 7.1CH, Dolby TrueHD and DTS-HD Master Audio. The front panel has coloured LEDs to indicate power (green) and HDMI input/output link (blue) status; the rear panel houses all HDMI I/O connectivity and 5V DC input. Included accessories: 5V DC power supply. 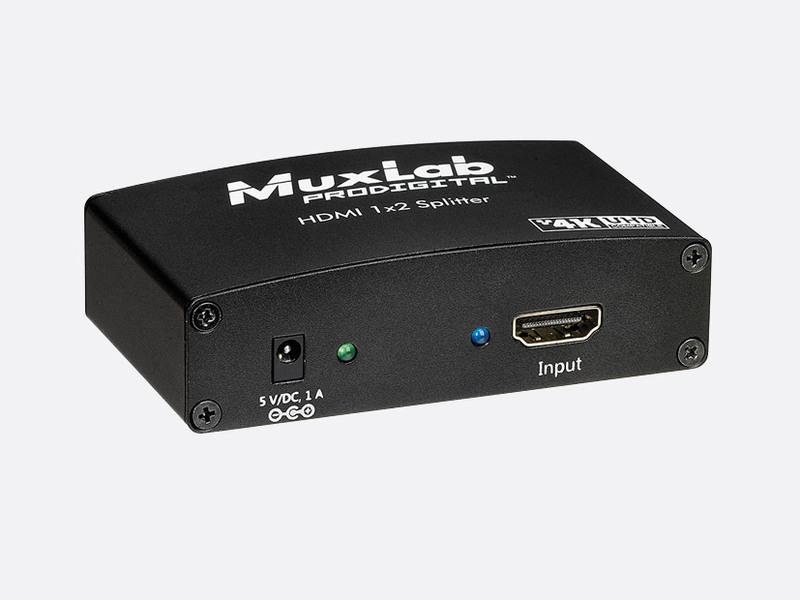 This 1x2 HDMI 1.4/2.2 compliant splitter is housed in a metal enclosure and supports up to 4K, 60Hz (4:4:4), HDR and 12-bit deep colour. LPCM 7.1CH, Dolby TrueHD, Dolby Atmos, DTD-HD Master Audio and DTS:X audio formats are supported. The front panel has coloured LEDs to indicate power (blue) and HDMI input/output link (green) status. The rear panel houses all HDMI I/O connectivity, USB service connection, rotary switch to select the EDID (external display identification data) mode, and 5V DC input. Included accessories: 5V DC power supply, mounting brackets. 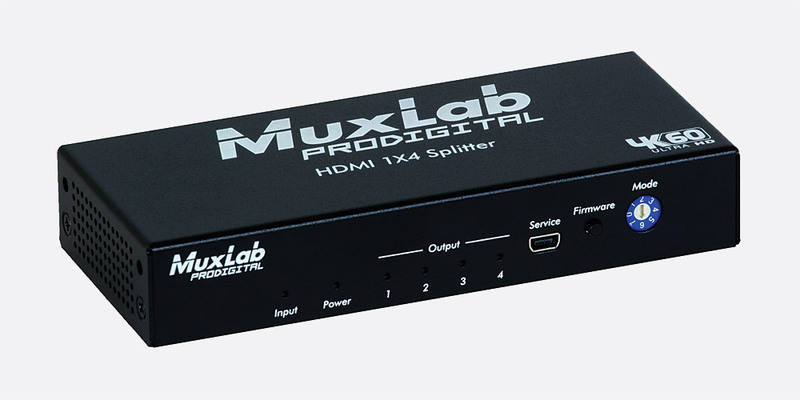 A 1x4 HDMI/HDBT splitter for use with single HDMI 1.4 and 3D source input and up to four HDBT outputs. 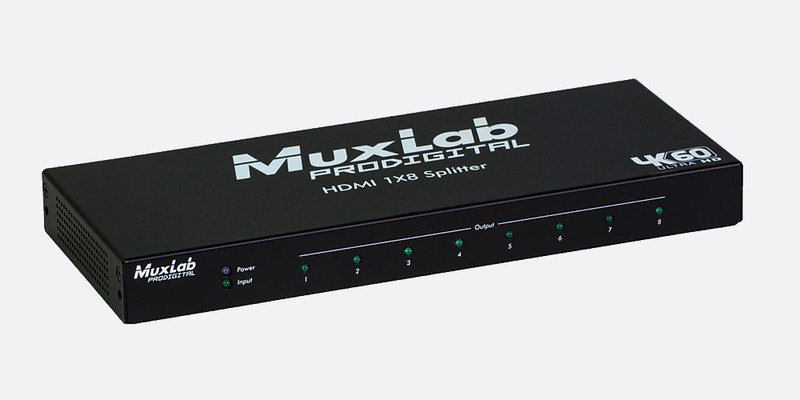 A local monitoring output is provided by way of HDMI connection - this can also be used to cascade up to four additional splitters. Supports 4K, 30Hz (4:4:4) and is HDCP 1.4 compliant. Audio formats supported include PCM, Dolby TrueHD, and DTS-HD Master Audio. The front panel has status LEDs for power (red), HDMI (green) and HDBT (green), as well as a USB port for service and firmware updates. The rear of the unit houses all other I/O connectivity including 4x RJ45 for HDBT connection, 3x 3.5mm jack sockets for IR input, output, and cascade, 2x 3-pin terminal blocks for RS232, and 2x HDMI connections for HDMI in and loop/monitor out. Included accessories: 24V DC power supply, mounting brackets. These are 1x4 (500426) and 1x8 (500427) HDMI splitters designed to distribute a single HDMI 2.0 signal to up to four or eight HDMI displays. They support up to 4K, 60Hz (4:4:4), HDR, deep colour and HD audio formats including LPCM 7.1CH, Dolby TrueHD, Dolby Atmos, DTS-HD Master Audio and DTS:X. They are HDCP 1.4 and 2.2 compliant and have eight/sixteen stage rotary switches to select the appropriate EDID mode. The rear panels house all I/O connectivity (with the exception of a front mounted USB connection for service on 500426). All connectivity is by way of HDMI connection with the exception of the 5V DC power supply.